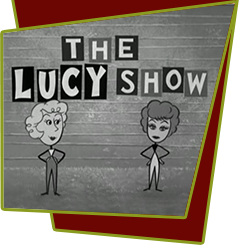 Lucy gets a temporary job on a newspaper and messes everything up. After just three days as the fill-in society reporter for the Danfield newspaper, Lucy's job is hanging by a thread. The only thing that will save her employment is an interview with the press-shy financier who is visiting town. She learns that the famous financier is an old flame of Viv's and was her high school sweetheart. Lucy heads down to his hotel for a scoop after she disguises herself as Viv to get an interview and save her job. Special Notes: Shortbridge High was the real life Indianapolis high school of writer Madelyn Davis. The yearbook Lucy and Viv look at was a real yearbook Madeline Davis brought in from home. The character Argyle Nelson was named after Desilu's Vice President for Studio Operations and was the Production Manager on her previous series I Love Lucy and The Lucy-Desi Comedy Hour.